Girls’ Surfing Programme takes on life of its own. The first 3 month block of our Girls’s Go Surfing Programme sponsored by the U.S. Embassy has seen 40 girls from 9 years to 20 years old experience the thrills and confidence building that mastering something that seemed, at first, perhaps a little daunting but upon trying and persisting, discovered was well within their capabilities and SO MUCH FUN! It’s been a particularly rewarding time with whole village communities from male and female village elders to young children coming to support, enquire, understand and join in with the action. Although focussing on the girls, we do not limit our initial classes to just girls as this would mean we missed out on our portal to the rest of the community. Teaching a skill outside in and open area where all the villagers can come and see and join in allows transparency and, in a playful, familiar and informal environment opens the lines of communication, enabling us to address many issues, for example rubbish disposal habits, perceptions of girls and women, in a non-threatening manner. Locals tell us that they feel very happy and proud that their children are learning a new skill and enjoying it so much. And that they love watching it, especially the local women! At one village, Bido, they come and sit under a beautiful large tree often nursing a baby, and we can hear their whoops of excitement when the girls stand up or fall off!! We also get to chat with these women and gain insight to their lives gaining valuable data about social realities, for example diabetes is a serious issue in the village, one woman showed me her foot missing three toes which have recently been amputated, equipment enabling them to monitor the insulin levels in their blood are five times more expensive in Morotai than Jakarta and local health outposts don’t have any. The village men ask general questions, curious about where we are from and keen to share who they are. After surfing class, we’ve enjoyed coconuts freshly picked from one of the locals shinnying up a coconut palm, evening meals in locals’ houses as we are all hungry after many hours in the water, joint surf outings so girls from different villages can surf together and share how they feel and begin to create a girls’ surfing identity and long chats about Morotai, surfing, English, tourism, fish, the rubbish on the beach, dancing, how old people get married, why we want tanned skin and they want white skin! This has enabled us to build bonds of trust and friendship. And the best result of all? 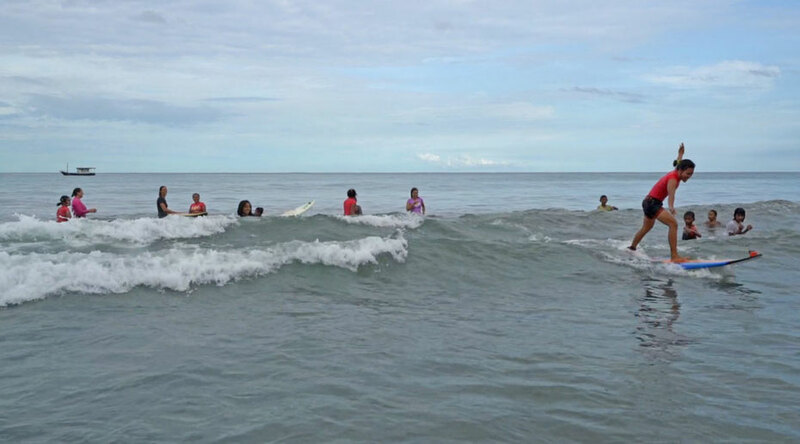 Girls’ Surfing is already spreading to other nearby villages. They are already sharing their skills and creating a surfing sisterhood. We met a young girl of ten years old in a village who gave me a big smile, threw me a shakka, and told me a friend of hers from Tawakali had taught her how to surf! She wanted to know when we would begin a programme in her village as she had friends who want to learn too. To see the joy, pride and excitement on her face made my heart beat faster. Go Girls! You got this wave you are riding…..